Back in the day, when I began to get interested in ASP.NET application architecture and design, I spent hours hunting for a book that would explain all I needed to know. I wanted one that focused on ASP.NET, with its special demands, rather than a general .NET development book. I wanted a book that would explain what layers and tiers were, and how I should separate code out to make it more scalable and reusable. I wanted a book that would explain how I could take my skills to the next level. I couldn't find one. There was a big gap in the market. Vivek Thakur has attempted to fill this gap, with this apty named title: ASP.NET 3.5 Application Architecture and Design. The book is aimed at beginners and intermediate ASP.NET developers primarily. Vivek claims in his preamble that experienced developers would also benefit from reading the book. It is intended to provide an understanding of architecture and design in a practical way, rather than a theoretical one. The first chapter looks at the difference between tiers and layers, and explains what you get from ASP.NET out of the box. There is also an interesting, but brief look at project management. The second chapter looks at the code-behind model in a lot more detail, before dismissing it as suitable only for a simple Guestbook application. Chapters 3 and 4 look at layers, tiers and spend a bit of time introducing UML, before Chapter 5 looks at ASP.NET MVC. Design Patterns are the focus of Chapter 6. Chapter 7 covers Service Oriented Architecture and WCF, followed by Database design in Chapter 8. Chapter 9 wraps the book up within 250 pages, with a rather unconvincingly tacked-on look at Localisation. Now, I could have ended my review of this book here. If I had, you would probably feel the same way as I did when I finished the book - less than satisfied. One of the main problems with this book is that it simply isn't long enough. It has the feel of a series of blog posts that have been published over a period, where the author needs to remind the reader of what was said in previous posts made some weeks or months ago. For a short-ish book, there is a lot of repetition. And the repetition doesn't make up for the lack of substance. 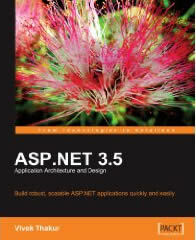 Vivek introduces a number of concepts, and I am sure that developers who want to learn the basics of structuring an ASP.NET application will get a fair amount out of this book, but it would have been better entitled "Beginning ASP.NET 3.5 Application and Architecture". It's the lack of deep-diving that prevents this book from becoming a "Bible". Actually, it's more than that. The code samples are poorly formatted (although that could be taken care of in a trice if the book is ever reprinted), but the language doesn't flow that well. Vivek does a good job in explaining how to layer code so that it is more maintainable, reusable, scalable etc. But he falls into the same cliche that all others who write about architecture seem to. He talks about there being ultimately two kinds of web project - enterprise applications and guestbook sites. No one discusses the middle ground, which probably accounts for 70% of development. He doesn't really explain what the tipping points are that should make a developer consider one architectural approach over another. It's an all-or-nothing kind of thing. For a book that is aimed at taking developers from the code-behind approach to a higher level, there are serious (in my view) omissions. Testing is brushed up against in a few places, but I would like to have seen this warrant a separate chapter. I would like to have the various testing tools explained as well as how to use one or two of them. I would like to have seen some discussion over the various approaches to larger scale development, such as TDD etc. There are a lot of other tools available to aid in larger scale development, such as Inversion of Control containers, source control packages, and most obvious of all, Object Relational Mappers. I was disappointed that none of these were even mentioned. Even as a beginner, I would love to have known what all these were and whether I should be using them. If this book had been clearly labelled as a beginners guide, I would probably give it 3.5 out of 5, with the caveat that you would need to pick up other references to provide a full introduction. If the publishers are serious that the book should be useful to developers who have already moved beyond the SqlDataSource control, I'd givethat claim 0 out of 5. One final thing. This is the first Packt book I have ever picked up. It won't necessarily be the last, but the next book may be if it is as poorly edited as this one.